On this screen you can quickly add attributes and their selection type, sorting and terms. Once you have attributes added to your store you are ready to add some variable products and then add those attributes to your variable product. In the image below you can see the attribute “Sizes” has been added and the terms of the attribute have been added to the “Value(s)” window. Once you have saved your attributes it is time to save your product. In the next image you can see multiple product variations that have been added for a single variable product. 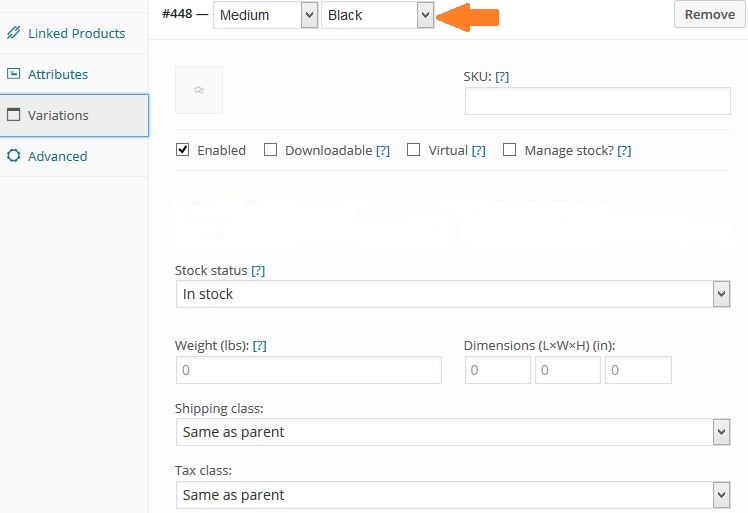 On the frontend of your store site variations need to be selected before the price and add to cart button is displayed, unless you define a default variation in which case it will be displayed immediately. Should you not have the time to add product attributes or need to add attributes which you only need available for one particular variable product you can create and variable product and add the attributes as shown below using ‘pipes’ (this is a pipe | )to separate the attributes. If you are unfamiliar with ‘pipes’ these are created using the (shift key + backslash) keys on a standard US keyboard. The important thing to remember is that attributes added using this method will not save and therefore will not be available for use in other variable products.